There are two blue threads in the selvedge of this fabric. In 1774, influenced by developments in the home production of cotton pioneered by Arkright, the previous ban on printing all-cotton fabric in England was removed. One of the terms of the legislation was the requirement that blue threads should be woven into the selvedge of English cotton cloth so that excise officers could distinguish between domestic and imported cotton, and charge a lower rate of duty on the former. 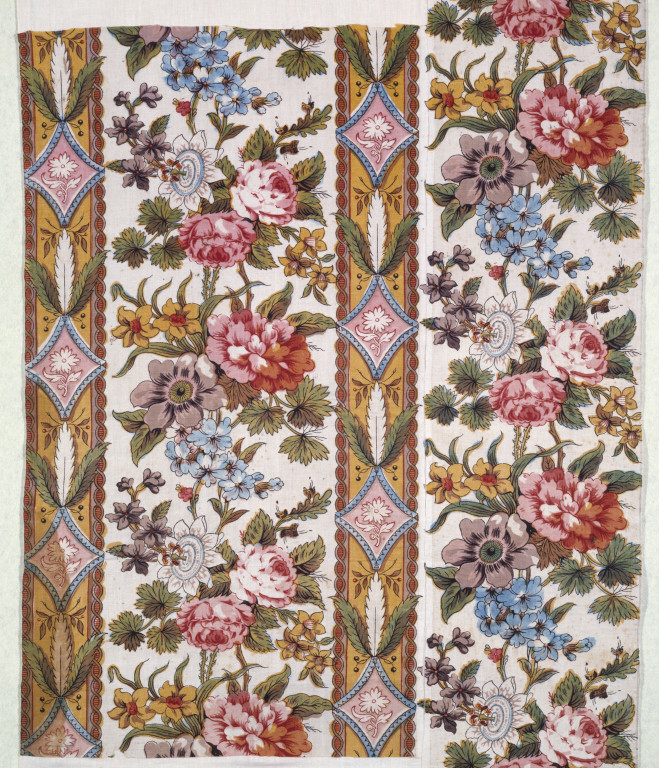 This regulation, which lasted until 1811, helps with the identification of printed textiles as English. Furnishing fabric of printed cotton. 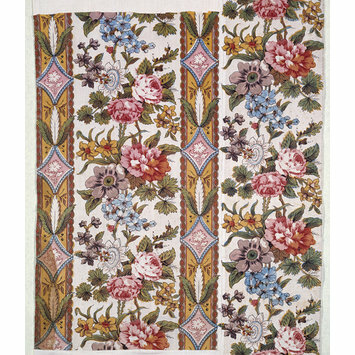 White ground with broad stripes of mixed flowers in a full chintz range of colours, including a passion flower. Between are stripes with a yellow ground and green leaves springing from a blue edged pink lozenge containing a flower reserved in white and outlined in red. There are two blue threads in the selvedge.